I want to show around my work and get feedback. I currently have a small business, selling a variety of products that center around curiosity, imagination and creativity. I made this macarons yesterday, so I am taking a break from updating all my posts to add this one. I tried doing macarons for the first time 2 years ago, and it was a complete catastrophe. I thought I would never even attempt them again, but I think they are so adorable, I allways wished I could make them myself!! 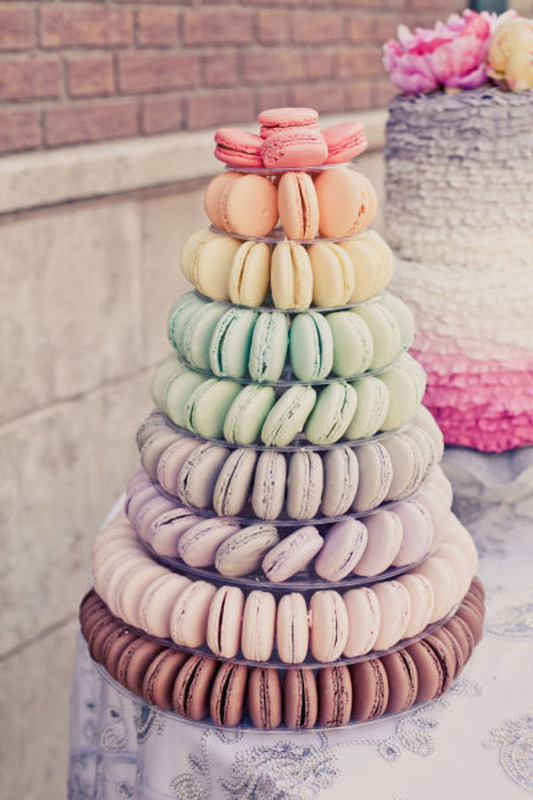 I went to france in December and visited Pierre Hermé, Ladurée, and every other Pastry shop I could, so since then it has become almost an obsesion to figure out how to make the perfect macaron that grows, has feet, is moist, colorful, fluffy and adorable. To make the merengue: Beat the egg whites with an electric mixer. once they start forming soft peaks, start adding the white sugar, one tablespoon at a time while beating the eggs, until hard peaks are formed. It takes around 10 min. of constant beating to form hard peaks. Add food Coloring to the merengue (to make the chocolate shells you can either add brown food coloring, or add 2 tablespoons of cocoa powder to the confectioners sugar & almond flour mix). Sift the almond flour and confectioners sugar together, and get rid of any large pieces of almonds that stay in the sift (if they are a lot, you will need to replace them with more almond flour, or you will end up with less than the 120g of almond flour that te recipe requires). Add the confectioners sugar & almond flour mix to the egg whites and mixt them in carefully until they are completelly incorporated and the color is the same everywhere. 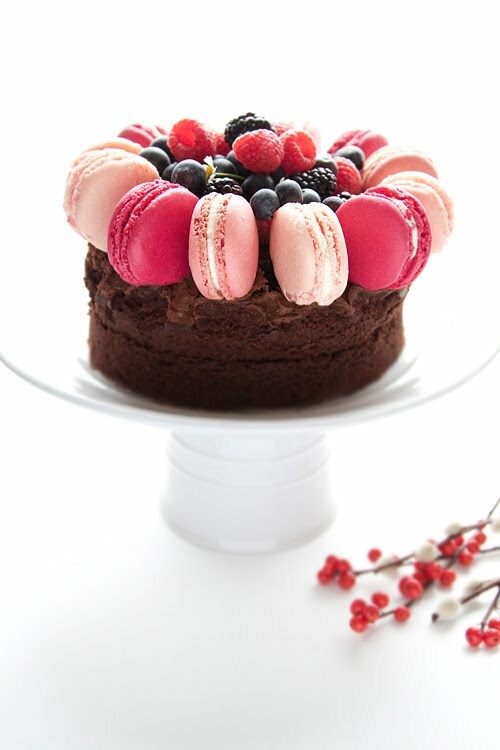 Put the mix on a piping bag and pipe out the macarons onto a baking sheet (do not pipe them directly on a baking pan, and do not add butter to the surface where you are piping the macarons). Once you have piped out all of the shells, tap the baking pan on your table 2-3 times, until little bubbles appear on top. Leave the shells to rest in a cool place for 30 minutes, until the top has dried out a little and doesn’t stick immediatelly to your finger. Preheat the oven to 150º C or 300º F and bake them for 15-18 minutes. Place the nutella in another piping bag, and cut the raspberries in halves. Once the shells come out of the oven, leave them to cool and then carefully remove them from the baking paper. Place some of them up-side down, and pipe the nutella on the inside of the shells. 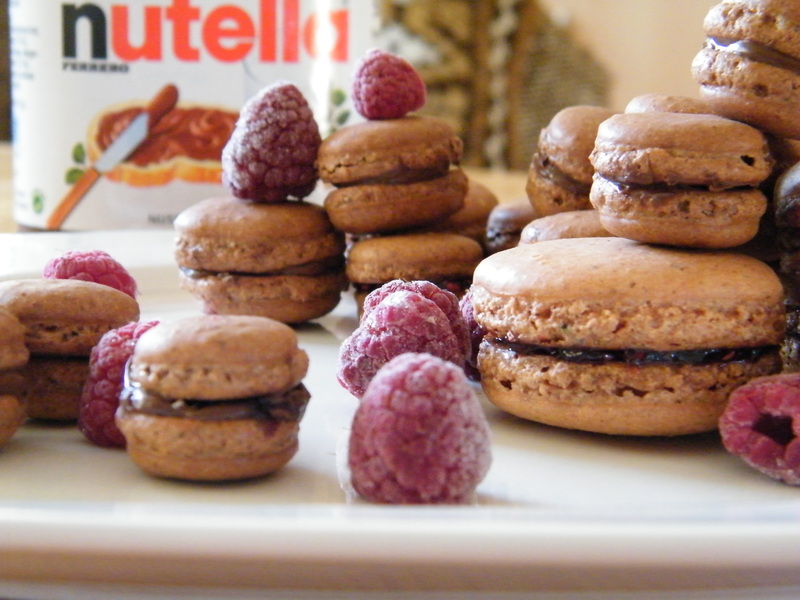 Place 1/2 of a raspberry on top of the nutella and close the macarons. 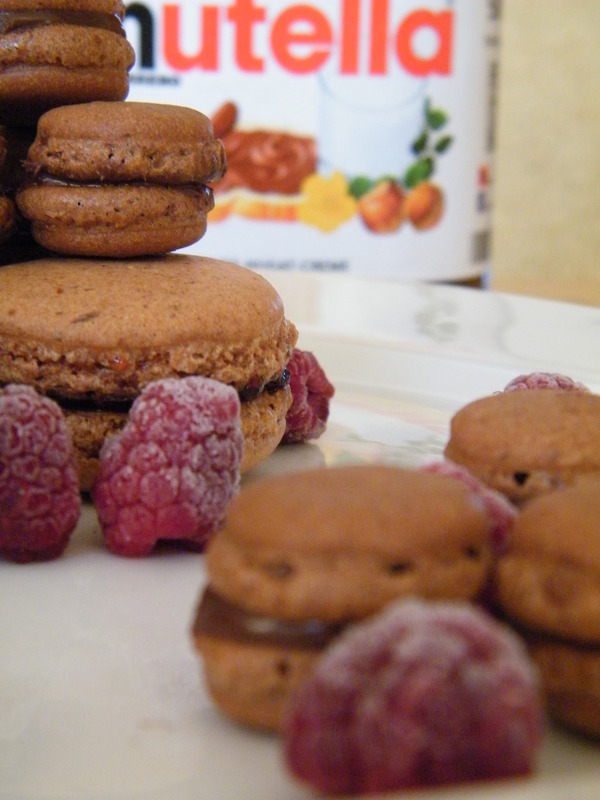 Leave the macarons to rest for 2 days before you eat them!! This is important, because if you eat them on the first day they will be extremelly dry, but after 2 days they will become softer and chewy like macarons should be. I will keep them in a box and take them to some friends to try tomorrow, once they have had enought time to become a little moist fromthe filling, but here are some other things you can do with them, like macaron towers, or you can give them as gifts in little boxes, or place them in fancy glasses as decoration for a dessert table. Here are some ideas, and photos from pastry shops in Paris that are famous for their macarons. 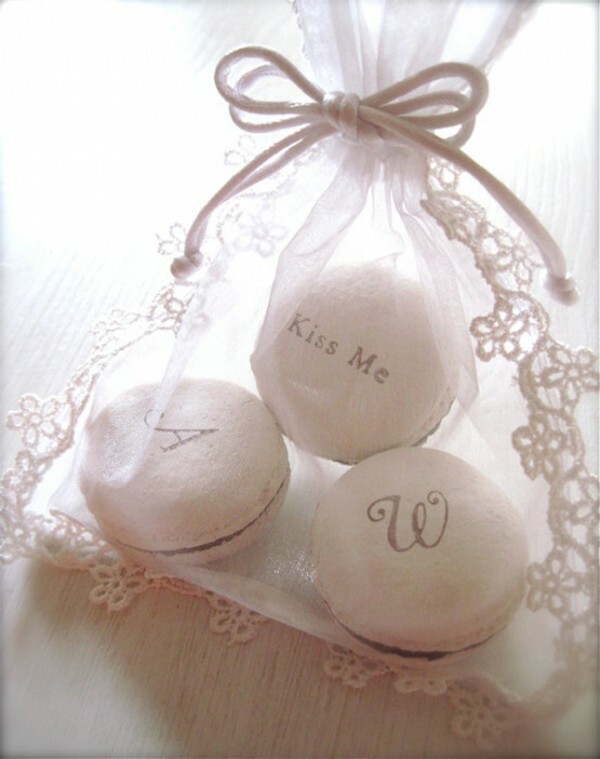 I thought this was a wonderful idea to give macarons at wedding receptions, I made something similar but in little boxes a while back, althought my version wasn’t marked like these are, and I love the fact that the handwriting looks so perfect. 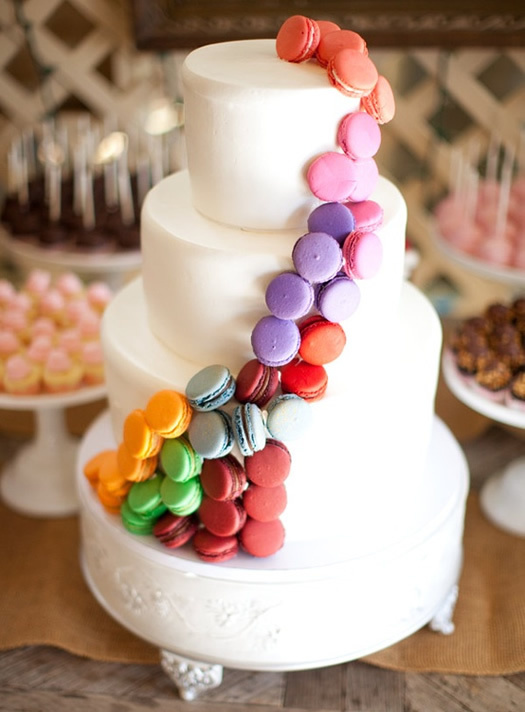 I found these in the Ocasions Magazine website, where they have lots of ideas on how to incorporate macarons to cakes or place holders for weddings. 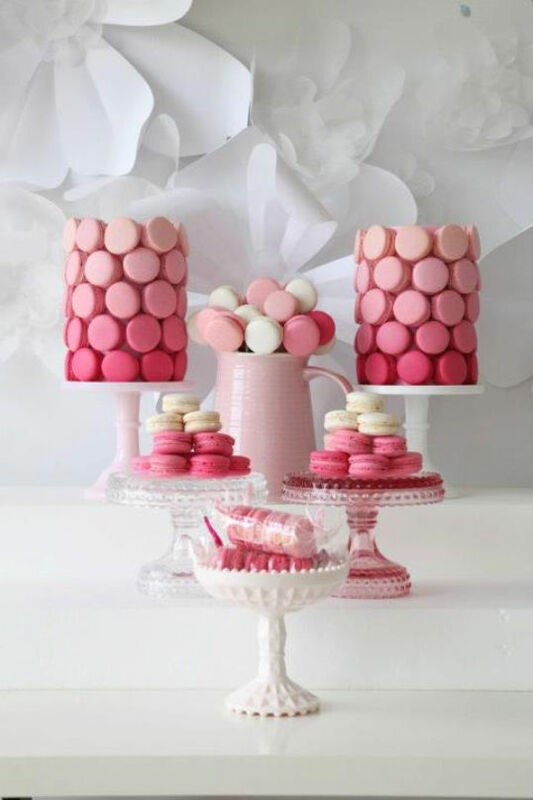 I found this beautiful macaron tower at Style Me Pretty, and loved the pastel colors and the fact they are placed vertically, so they aren’t pasted to the tower and are easy to take and eat without damaging the tower or the macaron. 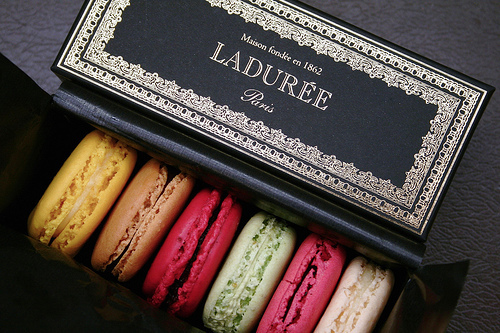 This is the last picture, and they are just about the most expensive macarons in the world. Ladurée has the most beautiful window displays, and they are famous for their macarons, as well as other pastries, like the Saint Honoré.